Most of the time I'm in a pretty good mood (wish I could say the same about Mr. S), but there are times that I feel a little irritable. My REAL struggle is with JOINT PAIN. MAJOR joint pain. I try not to talk (or think) about it much, but I live with mobility problems and one of my knees is stuck in a flexed position. This puts my whole body out of whack and the result is hip, back and knee pain. I've recently started taking Nature Made SAM-e. While it would be nice if it gave my mood a boost, I'm really looking for a little more comfort in my joints. In all honesty, it's only been a week since I've started. I think that my hip has improved, but really it's probably too soon to see a huge difference. 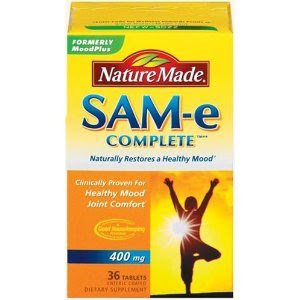 SAM-e works by helping other molecules in the brain do their jobs, thus making you feel like your normal self. When your SAM-e levels run low, those other molecules can’t do their jobs as effectively, and you can feel out of sorts from a mood standpoint. It's also supposed to provide joint comfort. It should take about 7 - 14 days to see a difference (and I have to admit that I forgot to take a pill a couple of days this past week), so hopefully by the end of next week I'll be in less discomfort and even MORE cheerful (if that's possible...LOL). SAM-e is a naturally occurring product in your body, and there are no known side-effects, and most people can safely take this supplement. We'll see if it kicks in completely by the time I get to BlogHer (cause I'll be doing quite a bit of walking and that's where it gets a little IFFY for me). If you'd like to try Nature Made SAM-e for yourself. They're offering a $3.00 off coupon on their website. Plus Nature Made SAM-e comes with a 100% satisfaction guarantee. I wrote this review while participating in a blog tour campaign by Mom Central on behalf of Nature Made and received products necessary to facilitate my candid review. 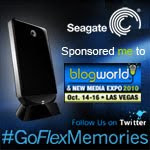 * This giveaway is open to US residents, 18 and over and ends on August 18, 2010 11:59 EST. 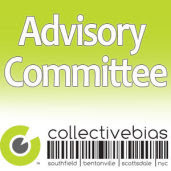 I subscribed with feedburner/Google Reader to CL!